The fifth of five volumes collecting the complete stories of renowned weird fiction” author Clark Ashton Smith. Clark Ashton Smith, considered one of the greatest contributors to seminal pulp magazines such as Weird Tales, helped define and shape weird fiction” in the early twentieth century, alongside contemporaries H. P. Lovecraft and Robert E. Howard, drawing upon his background in poetry to convey an unparalleled richness of imagination and expression in his stories of the bizarre and fantastical. The Collected Fantasies series presents all of Smith’s fiction chronologically. Authorized by the author’s estate and endorsed by Arkham House, the stories in this series are accompanied by detailed background notes from editors Scott Connors and Ron Hilger, who in preparation for this collection meticulously compared original manuscripts, various typescripts, published editions, and Smith’s own notes and letters. Their efforts have resulted in the most definitive and complete collection of the author’s work to date. 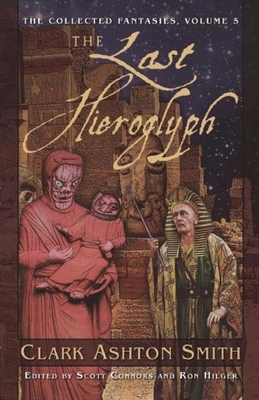 The Last Hieroglyph is the fifth of five volumes collecting all of Clark Ashton Smith’s tales of fantasy, horror, and science fiction. It includes all of his stories from "The Dark Age" (1933) to "The Dart of Rasasfa" (1961). Clark Ashton Smith was a self-educated poet and author best remembered for his short stories of fantasy, horror, and the supernatural published in genre pulp magazines such as Wonder Stories and Weird Tales in the late 1920s and 1930s. Smith died in 1961 in California.